Humans have relegated insects to the lower levels of the cognitive totem pole, but scientists are increasingly showing it’s a mistake to underestimate invertebrate intelligence. As a case in point, new research by French and Australian researchers suggests honey bees understand the concept of zero—a rare and complex capacity shared by an exclusive group of animals. 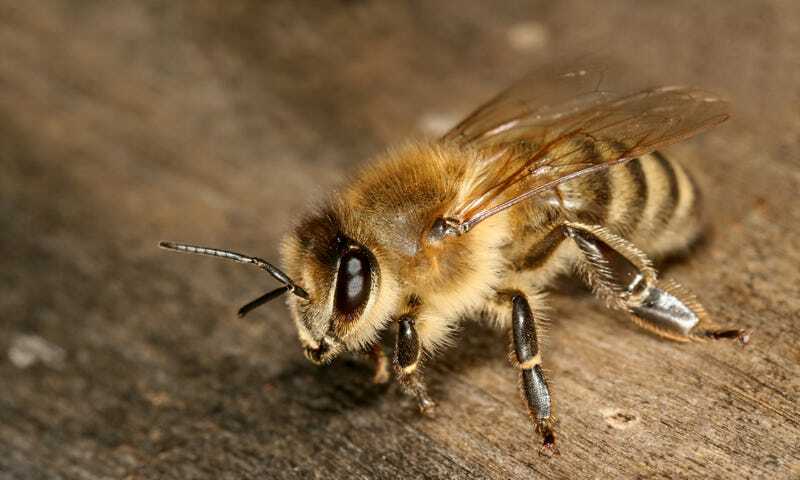 Dyer, with the help of his colleagues at the University of Toulouse in France, recently concluded a series of experiments suggesting the answer is yes, at least among honey bees. The apparent discovery that bees understand the concept of zero, or nothing, means these animals are smarter and more adaptable than we realized, and that big, bulbous brains aren’t necessarily required to comprehend some seemingly complex or abstract ideas. The new study, published today in Science, should also serve as inspiration to researchers involved in AI and robotics; there are simple and efficient ways to get small brains to perform powerful tricks. A honey bee during the experiment. Bee brains have fewer than a million neurons, compared to the 86 billion neurons packed inside the human skull. But studies have shown that honey bees are capable of some extraordinary cognitive feats, such as understanding “same” and “different,” learning intricate skills from other bees, and the capacity to count (a trait known as numerosity) and to discriminate up to four objects. For the new study, Dyer and his team wanted to know if honey bees understand the concepts of “greater than” and “less than,” and by consequence, if they can extend this ability all the way down to zero. For the experiment, the researchers lured honey bees to white sheets pasted on a wall, each of which contained between one and six dark shapes. Using a food reward in the form of a sugar solution, the bees were trained on “greater than” and “less than” tasks. So for a “less than” task, a bee was rewarded if it went to the sheet containing three black dots instead of the sheet with five black dots, for example. Following this training, the bees were confronted with a completely new type of display: a completely blank sheet. Incredibly, bees trained on the “less than” task consistently went to the blank sheet instead of sheets containing one or more black shapes. They seemed to intuitively know that “nothing,” or zero, is less than one, despite never being exposed to an empty set before. Now, that may not sound impressive, but it’s a huge deal. These insects are demonstrating a capacity so far seen in only a handful of nonhuman animals, namely primates (including rhesus and vervet monkeys) and the African grey parrot. Zero is something that even confounded early human civilizations, with some early numbering systems lacking the concept. A honey bee approaching a blank sheet of paper, suggesting it knows “nothing,” or zero, is less than the other values presented. This discovery now presents a fascinating problem for neuroscientists. Lars Chittka, professor in sensory and behavioural ecology at Queen Mary University of London, said the new study is another important contribution to the question of whether animals need big brains to solve tasks that have traditionally been thought of as complicated. Chittka, who wasn’t involved in the new study, said he couldn’t think of an obvious natural setting in which it’s important for bees to understand the number zero, but nonetheless, they appear to get it. That said, the finding is consistent with his own research on adaptive tool use in bees, showing that bees can flexibly cope with challenges they’ve never encountered before in their evolutionary history. But not everyone is convinced by these findings. Clint Perry, a research fellow and a colleague of Chittka’s at QMUL, says bees may very well be capable of understanding the concept of zero, but he doesn’t see the evidence for that in the current work. He says other simpler strategies can more easily explain the results. Perry, an expert in the cognitive capacities of animals with very small brains, says it’s interesting that bees might be able to understand the concepts of “greater than” and “less than,” but he believes a critical control was missing from the experiment, namely an accounting of reward history. There’s little doubt that more work needs to be done in this area, but it’s clear that bees, and likely many other insects, are capable of tricks we thought impossible for invertebrates. Keep that in mind the next time you reach for a bug swatter.